September 04, 2018 at 2:02 pm. 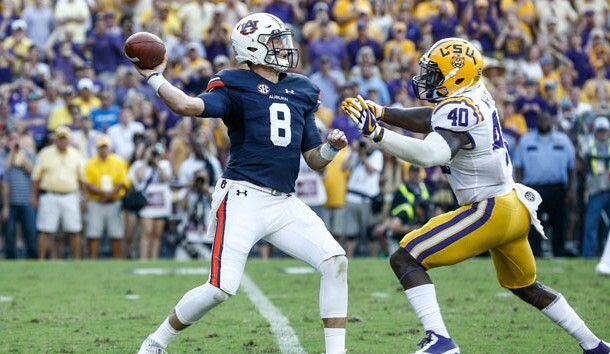 Auburn and LSU had a lot in common heading into this past weekend’s games, more than just the Tigers nickname. Both started the season away from home. Both were ranked in the season’s first Top 25 poll and both were playing against Top 10 teams. Neither was the popular choice to win the opener. Auburn was favored by 1.5 points by the oddsmakers in Las Vegas, but Washington was clearly the trendy pick, chosen by all three experts on ESPN Game Day before the game in Atlanta. On the other hand, LSU was a 10-point underdog, taken by almost nobody to win its game against Miami in Arlington, Tex. After losing the first game, Auburn’s schedule would pose too big of a challenge to remain a serious College Football Playoff contender. The Tigers are the only team in the country to face three of the Top 6 teams in the season’s first Associated Press poll (Alabama No. 1, Georgia No. 3, Washington No. 6 – none played at Jordan-Hare). The loss would leave no wiggle room. Same for the other Tigers. LSU’s schedule is even tougher than Auburn’s, if that’s possible. They play four of the Top 9 in the AP poll (Alabama, Georgia, Miami, Auburn). Of course after losing to the Hurricanes, being a serious CFP contender would also be impossible. But, a funny thing happened. Both teams won. Auburn won with strong defense throughout and a clutch, length-of-the-field game-winning touchdown drive in the fourth quarter. LSU won with a dominating, well-balanced offensive and defensive attack from the outset. Overall, the SEC had a successful opening weekend, but what else would you expect? Ten SEC teams – Alabama, Arkansas, Florida, Georgia, Kentucky, Mississippi State, Missouri, South Carolina, Texas A&M, Vanderbilt – played obviously inferior teams, in some cases embarrassingly inferior. Even though rebuilding Louisville doesn’t appear to be strong, playing its first game in four years without Heisman Trophy winning quarterback Lamar Jackson, it is at least a Power 5 (Atlantic Coast Conference) team. The other nine opponents – Eastern Illinois, Charleston Southern, Austin Peay, Central Michigan, Stephen F. Austin, UT-Martin, Coastal Carolina, Northwestern State, Middle Tennessee State. On paper, Middle Tennessee should have had a shot at upsetting the Commodores, but lost, 35-7. For the other nine match-ups – never a chance. The average score of those ten games … SEC Team 50, Opponent 12. Ole Miss was impressive, comfortably outdistancing Texas Tech, 47-27. And, Tennessee, playing against one of college football’s most dynamic and versatile offenses, was overwhelmed by West Virginia, 40-12 – the league’s only first-week loss. That leaves Auburn and LSU, the teams that took on the biggest challenges and the teams that came out as the biggest winners. Auburn had the most difficult task. Washington senior quarterback Jake Browning will end his career as the program’s all-time leader in passing yardage, passing touchdowns and total offense. Senior running back Myles Gaskin will be their all-time leader in rushing yardage and touchdowns. Each year, Lindy’s ranks the Top 10 teams by position. This season, Washington’s offensive backfield was rated the fourth-best in the nation. On the other side, the Huskies defensive line was rated No. 6 and the defensive backfield rated No. 1 – best in the country. This is very good Washington team, best one west of the Rockies, mentioned as possibly the best ever in Huskies history, still a likely CFP Final Four contender despite being beaten by the Tigers. Auburn was more than up to the task. Behind its offensive line, with only one returning starter, it had more rushing and total yards than Washington. First-time starting running back Kam Martin outgained Gaskin by five yards. Tiger junior quarterback Jarrett Stidham completed 26 of 36 throws for 273 yards, one touchdown and no interceptions, comparing favorably to Browning’s 18 for 32 for 296 yards, one score and one picked off. Three times the Huskies had 1st-and-goal inside the Auburn 10-yard line. That resulted in no touchdowns and one field goal. And, with the game on the line, Auburn’s offense drove 76 yards in 10-plays for the winning touchdown with freshman JaTarvious “Booby” Whitlow powering into the end zone from 10-yards out. It was a different story in Arlington. The underdog Tigers jumped on the Hurricanes early in the game and didn’t let up. A 50-yard sprint by Nick Brossette just before the end of the first quarter broke a 3-3 tie, then his short touchdown run six minutes later ran the score to 17-3. The halftime margin was 27-3 after a 45-yard pick-six by linebacker Jacob Phillips late in the second quarter. The game was decided; the only question was the final score. Apparently, LSU players didn’t read the reports of their expected demise. As a team, the Tigers outrushed Miami, 156-83 with the ‘Canes averaging just 2.4 yards per carry. The Hurricanes led in turnovers (2-0) and in penalty yards (85-62). They also led in passing yards, but that happens when you’re playing from behind the entire game. Ohio State transfer quarterback Joe Burrow was efficient, made few mistakes, had no interceptions. Miami’s Malik Rosier had more passing yards, but completed only 15 of 35 passes with two interceptions. LSU’s defense shouldn’t have surprised anybody. Last season, the Tigers ranked 14th nationally in scoring defense, 24th in rushing defense, 22nd in passing defense and 12th in total defense. In Lindy’s 2018 preseason college football edition, only one team had two players on first-team All-American defense. It was LSU – linebacker Devin White, defensive back Greedy Williams. It’s obvious that Miami was overrated. It was ignored in the preseason that the Hurricanes entered this year on a three-game losing streak, all by double digits, including a 10-point loss to 5-7 Pittsburgh. Make that four consecutive losses now, all by double figures. Only one Miami starter returns on the defensive line and only two Associated Press Top 20 teams are on the 2018 schedule (No. 19 Florida State, No. 20 Virginia Tech). But, none of that detracts from what LSU did on Sunday night. It defeated one of the only two Top 10 teams to lose its opener. It removed the early perception that this Tiger team can’t play with the nation’s top-tier teams. And, it did those things in efficient, methodical, commanding fashion. This sets up another gigantic game in two weeks, on Sept. 15, at Jordan Hare Stadium on the Plains. Barring an upset of unthinkable magnitude … next week LSU plays S.E. Louisiana; Auburn plays Alabama State … both sets of Tigers will be ranked, undefeated and playing for the early season position as a leading challenger for Alabama in the conference Western Division. Mark that Saturday on your calendar. Those two Tiger teams, the biggest winners in college football’s Week 1, will have a lot in common again, more than just having the same mascot. This time, even more will be on the line.